Garmin ECHOMAP Plus 45cv chartplotter features a 4-inch touchscreen with keyed-assist buttons for use in wet conditions. The Garmin ECHOMAP Plus 45cv when purchased from ActiveGPS comes preloaded with Bluechart with coverage for UK and Ireland. Garmin ECHOMAP Plus 45cv chartplotter features a bright, sunlight readable 4-inch touchscreen display. In addition for all weather conditions e.g. rain, ocean spray, etc the ECHOMAP Plus 45cv also features keyed-assist buttons, located to the right hand side of the touchscreen display. The Garmin ECHOMAP Plus 45cv when purchased from ActiveGPS comes preloaded with Garmin Bluechart g2 HD UK and Ireland. 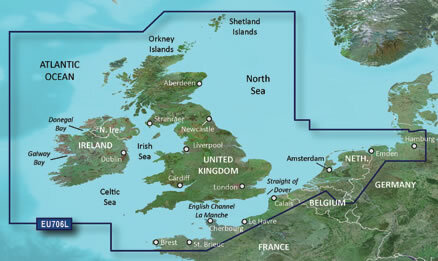 The BlueChart coverage includes coasts for UK, Ireland, and Northern France coastal waters. 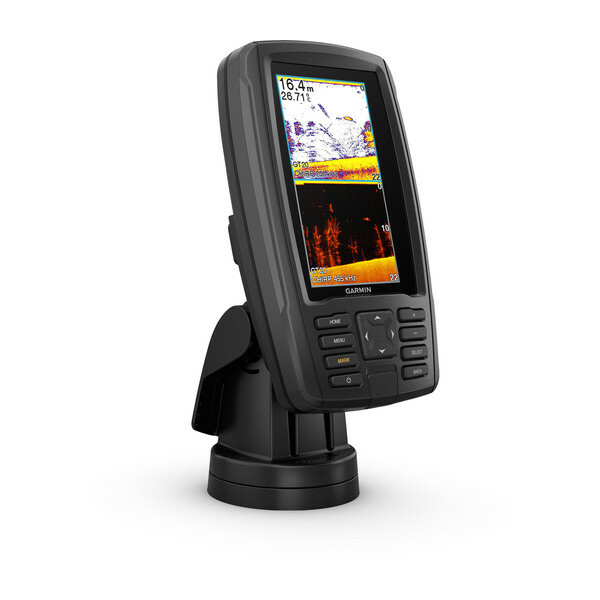 There is built-in support for Garmin high wide CHIRP traditional sonar plus CHIRP ClearVu and scanning sonars and Panoptix all-seeing sonar. (transducer sold separately). 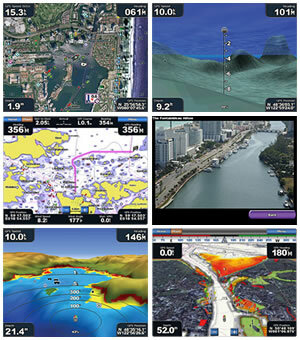 You will get crisp, clear images below your boat (ClearVu). Quickdraw Contours mapping software enables you to create personalised fishing maps on-screen with 1-foot contours as you fish. 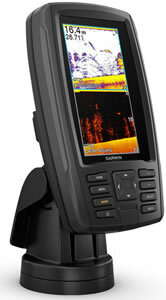 The sonar capabilities of the ECHOMAP 45cv enables you to see structure, submerged objects and fish. Clear target separation and definition provides more energy onto target than traditional sonar making sonar more effective. To find the perfect transducer to partner your Garmin ECHOMAP Plus 45cv and your boat please complete our online transducer form. Alternatively, if you know which transducer your require (we do however recommend that you complete our online form to find the perfect transducer) you can view the comprehensive range of transducers available buy from ActiveGPS. Pictured below, transom mounted transducer, thru-hull transducer and in-hull transducer. NMEA 0183 support for viewing engine data, adding sensors and more. 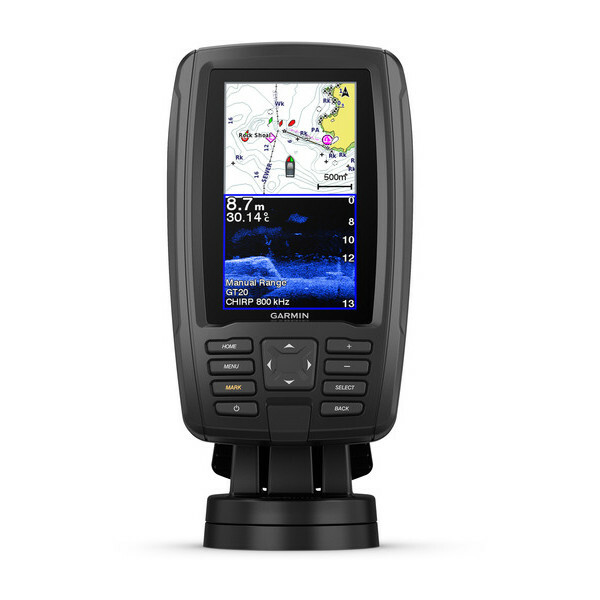 The Garmin ECHOMAP Plus 45cv when purchased from ActiveGPS comes preloaded with BlueChart g2 marine charts with coverage for UK and Ireland coastal waters. In addition customers buying the ECHOMAP Plus 95sv from ActiveGPS are entitled to one Free BlueChart g3 download within 12 months of purchase under Garmin's New Chart Guarantee. ‣NMEA 0183 support for engine data, sensors and more. 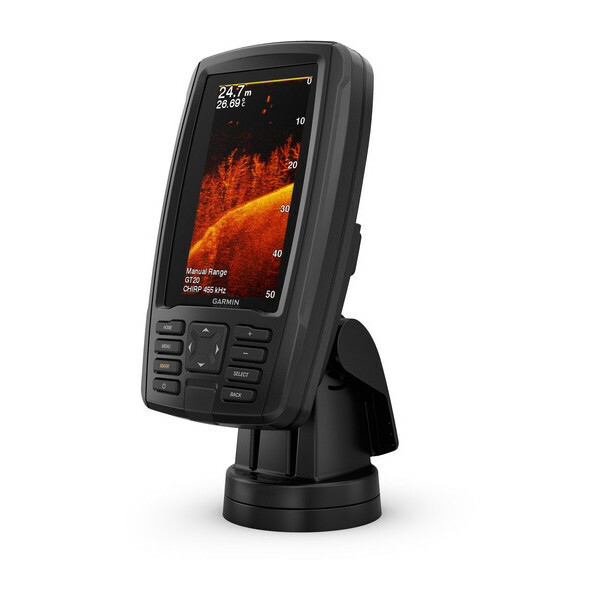 The Garmin ECHOMAP Plus 45cv comes complete with Tilt/Swivel Quick-Release Mount. The tilt/swivel mount surface mounts against most flat surfaces on your boat. 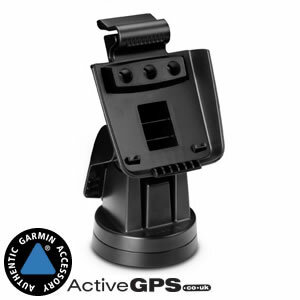 If required additional tilt/swivel mounts and other Garmin ECHOMAP Plus 45cv accessories can be purchased from ActiveGPS. Garmin ECHOMAP Plus 45cv marine chartplotter is preloaded with BlueChart g2 marine charts with coverage for UK and Ireland. In addition, customers buying the ECHOMAP Plus 45cv from ActiveGPS are entitled to one Free BlueChart download within 12 months of purchase under Garmin's New Chart Guarantee. 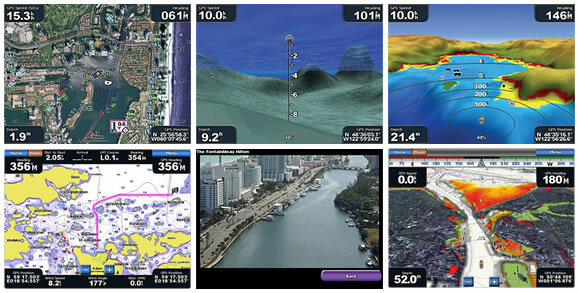 Looking for Garmin ECHOMAP Plus 45cv accessories? Accessories available to purchase include 4-inch protective cover, flush mount kit and tilt/swivel mount. If you'd like to add a transducer to your ECHOMAP Plus 45cv please see the Garmin transducers buyer's guide. Add Garmin BlueChart g3 and g3 Vision marine charts to your Garmin ECHOMAP Plus 45cv, view the different Garmin Bluecharts you can buy from ActiveGPS.